A wide variety of produce and locally made foods are available at Bahner Farm Stand in Belmont, including the farm's organic vegetables. 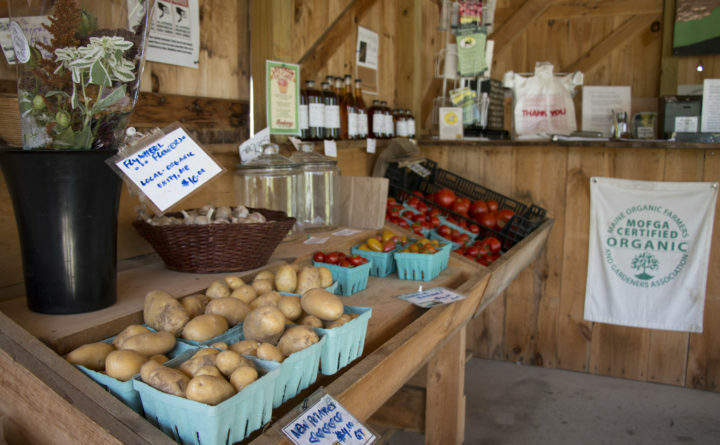 A wide variety of produce and locally made foods are available at Bahner Farm Stand in Belmont, including the farm's own organic vegetables, herbs and berries. 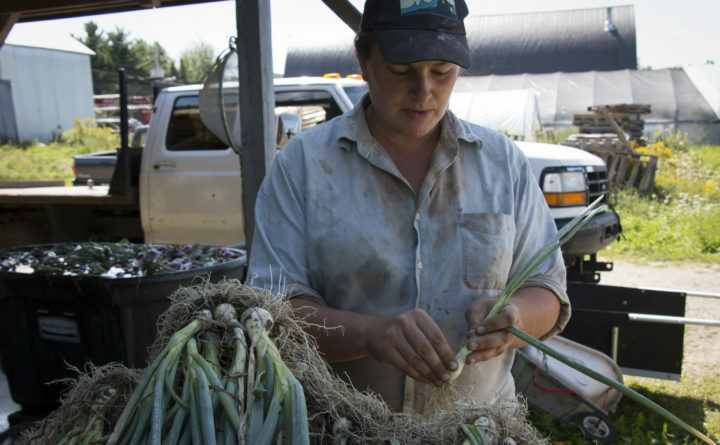 Christa Bahner, who owns Bahner Farm with her husband, Michael Bahner, prepares onions for sale on a worktable at the farm, not far from their roadside farm stand. 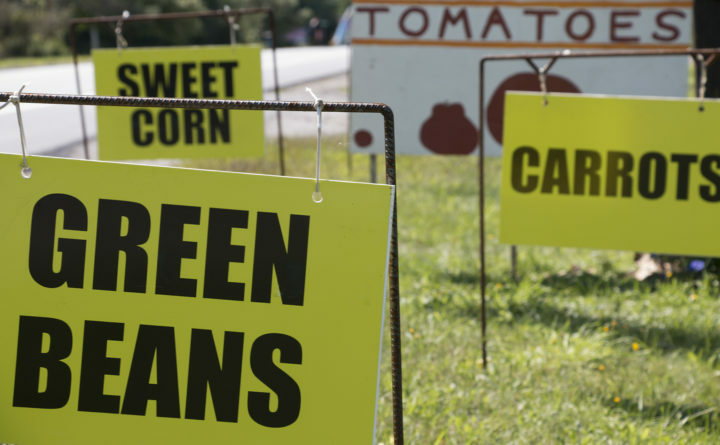 Several flashy signs mark the entrance to Bahner Farm in Belmont, where a farm stand is open daily from 10 a.m. to 6 p.m. during the growing season. Located on the busy Route 3 in Belmont, a road that runs from Belfast inland to Augusta, it’s no surprise that Bahner Farm has found success in selling their fresh vegetables roadside. In a charming wooden building with an open front, the farm offers about 30 varieties of organic vegetables that they grow on site, as well as seedlings and potted herbs. And to expand their offerings, the Bahners work with several nearby farms, creameries, bakers and gardeners, peddling their fruit, milk, bread, eggs, cut flowers and much more. Husband and wife Michael and Christa Bahner purchased the farm in 2009, and they opened the farmstand a few years later. Bahner Farm is chiefly a certified organic vegetable farm, with some fruit trees and berries on the side. With about 10 acres of fields and several greenhouses, they rotate their crops, planting about 5 to 6 acres of produce each season. 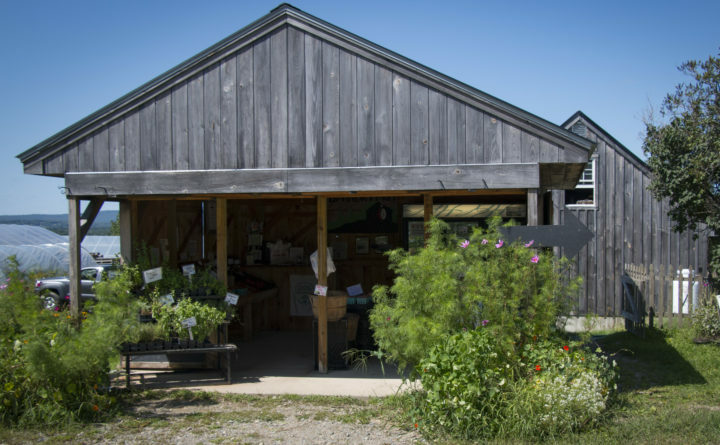 While the Bahners work in the nearby fields and greenhouse, the farm stand is currently self-serve, under the watch of security cameras, which they installed after a number of thefts. 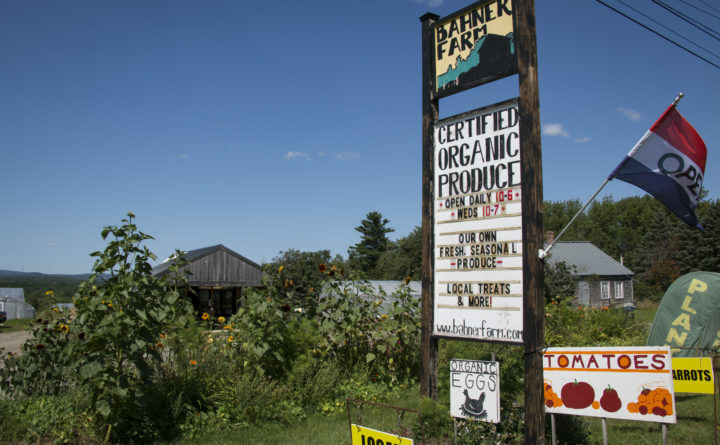 But next year, the Bahners plan to staff the farm stand, not just to prevent theft but to educate and assist customers, especially during the spring and early summer when the majority of their business is in seedlings. In addition to selling at the stand, the Bahners market their organic produce at farmers markets in Bar Harbor, Camden and Northeast Harbor, and they sell some wholesale to local stores. They also offer traditional and farm stand share CSAs and a winter buying club. But of all facets of their business, the farm stand is growing the fastest. Season and hours: Open daily from 10 a.m. to 6 p.m., with Wednesday hours extending to 7 p.m. throughout the growing season.